A source for quick and useful EdTech tips which should be on every online teacher’s watchlist is Richard Byrne’s Free Technology for Teachers. He has won many awards from Edublogs for his work, and speaks around the globe. While his blog covers a vast landscape of subjects, he has special collections on uses of Google Apps, alternatives to YouTube, creating blogs, creating websites, and creating videos. Byrne also has a YouTube channel you can explore, loaded with video tutorials. You can learn a lot, not only from the content of his videos, but from analyzing the videos themselves–what does he do that you can use in your own instructional tools? Have you ever tried to link up two (or more!) groups of students and teachers who are located in different places for an online meeting? In his Inside Higher Ed article about running web meetings and teaching synchronous web class sessions, Joshua Kim offers several tips for doing this well. Whether the groups are across the world or across campus, engaging in synchronous meetings brings many possibilities–and challenges! As many of us engage in new work with partners on other campuses and on other continents, we should learn more about how to create effective synchronous experiences for our students. The facilitator must own the digital space with confidence and focus. Prepare to be exhausted when you have finished. Be explicitly directive constantly, from telling people when to speak, where to put microphones, and so on. Achieving the meeting goals and distributing the conversation requires much more orchestration than an in person meeting. Talk less and talk differently. Your job is to get everyone engaged. You will have to direct and interrupt in order to keep everyone on task for the meeting’s plan. Get more detail by clicking on the link above. Have you run a synchronous class meeting on a web platform? What worked and what didn’t? Feel free to share your experiences in the comments! Thanks to Barry Bandstra who sent this article to be shared. I mentioned the New Google Sites app a few weeks ago as a sleek, improved way for teachers and students to create free web pages. Recently I came across a wonderful video in which Dean Stokes demonstrates how he recreates his existing website with the new Google Sites. I found this video useful because it is fast-paced and demos several really need techniques quickly, allowing me to see immediate results. If you aren’t sure what Google Sites is or if you feel that perhaps you aren’t comfortable enough with technology to use it, check out this demo. You’ll see that it really is an accessible app. Have you tried Google Sites yet? Feel free to share your experience in the comments. Though I’ve been teaching nearly thirty years now, it was only when I began to create online courses that I ran across the notion of “backward design” in pedagogy. Now I use it each semester as I plan all my courses. I find it a valuable way to make explicit my thinking about the alignment of goals, assessment, and activities. Because it makes me more carefully aware about the prioritization and linking of every class activity with an assessment and a goal, the backward design process helps me communicate these things to students, which in turn, seems to result in higher buy-in and levels of engagement from many students. The result (for me): a more tightly designed, purposeful course experience for me and for my students. This becomes even more important when I enter the flipped, hybrid, or fully online realm for teaching. The video below, featuring UW-Madison professor Erica Halverson, provides a quick (under 10 minutes) overview of backward design and the questions it asks us to consider. In particular, I really like the focus on “what does it mean to be a practitioner/student of X?” because I think this helps me focus on what is unique and most valuable about X (for me, creative writing). I also appreciate the question of “what do you want them to still ‘have’ in 10 years after the completion of the course?” This helps me focus my priorities. Of course, if you want to learn more about it, you can Google “backward design,” you can find videos of many talks and workshops and webinars on the topic. This speaker mentions Grant Wiggins and Jay McTighe who have written and presented extensively about the topic. Interested in learning more about digital portfolios, but not sure where to start? Why not give Seesaw and its “learning journal” approach a try? Many of us have heard of the value of having students keep a portfolio so that they can regularly review their learning in a class. This leads each student to review the class content as it is gained, and to a deeper understanding of the self as a learner. With Seesaw, you can capture student learning in many forms, including text, photo, video, audio, links and direct imports from other apps. You can also collect information via PDF. Students control the content in their Seesaw “journal” and it is immediately accessible to the teacher. There is an excellent overview especially for teachers here. You can also find more help at the Seesaw Help Center. Though Seesaw is clearly targeting itself to the K-12 market, don’t let that fool you. It is a powerful and malleable tool for encouraging students to show what they know. This, in turn, allows you to assess the success of your course and departmental curriculum. Privacy can be set by the teacher–selected student work can be shared via blog. Seesaw also has global collaboration capabilities, to connect with other students in other countries using Seesaw. Teachers browse by student or by class. Seesaw provides multimedia methods for creating portfolios to document student learning. It works across mobile devices and on computers with Chrome or Firefox. It offers broad capability with other apps. It organizes work by student, folder and date. The free version allows one teacher to run Seesaw for up to 10 classes a year. Paid versions even integrate assessment tools and analytics. Have you used Seesaw in your higher ed classroom? What about other digital portfolio applications? Oh my goodness, I have just begun to learn about this amazing free tool (paid memberships have more features, of course), for presenting lessons in a live class or live to participants located anywhere, as long as they are all online at the same time. Presentations are structured like slideshows. You, the teacher, control it from your device–computer or mobile. Students see, on their devices, whatever slide you access on your device. But the amazing part? You can build into it polls, drawing, short answer questions, quizzes and other activities. As students interact, the results from each device come to your device. You can see exactly which student is doing what on his or her device–on your device! Poll numbers are charted instantly, quiz results are aggregated instantly, and you can share these back to the students if you want. Students can draw or work out problems on a whiteboard and you see what they produce as they submit it. They’ve made it easy for teachers who use Google Slides or Powerpoint presentations to “Nearpodize” existing presentations and creative active lessons with them. You can read more about that process on their blog. What Nearpod does, for free, is hard to image, so I encourage you to check out the main website and tutorials which you can find here. There is an extensive and strong tutorial here at Making Tech Simple–though note that while this tutorial guides you to using Nearpod through an iPad app, you do not need to do this. You can do it through a computer. Have you used Nearpod? If so, please share your experience in the comments. Of the many great tools out there for making flowcharts, mind maps, and diagrams, Lucidchart may be one of the best. Use Lucidchart for brainstorming to project management. Use it alone or collaborate with others. Design your own classes and lessons. Have students use it to outline papers visually, reconstruct lessons, show relationships among facts, map an argument or to show knowledge acquisition outside of a quiz or test! They can collaborate on projects with colleagues in other parts of the world as well. You can learn more at the Lucidchart website. Of particular interest to Google Apps users, Lucid chart integrates fully. You can save charts as .jpgs and .pngs and in many other formats. You can also export to most common Microsoft documents, as well as other commonly used software. They offer a wide variety of paid plans, and a free plan with limitations on use. 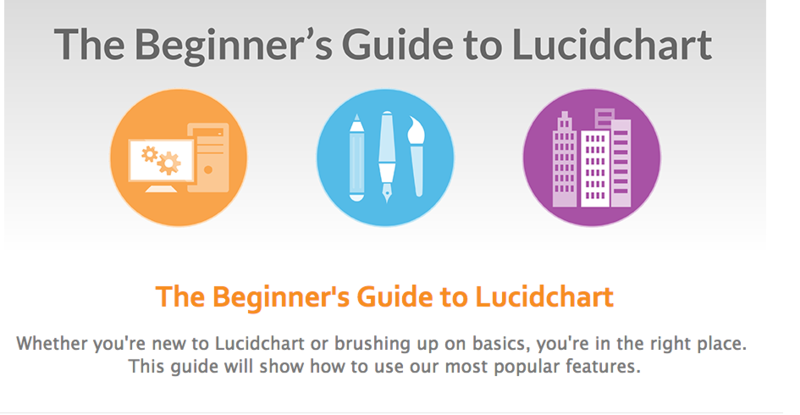 Check out “The Beginners Guide to Lucidchart” to learn more about what you could do with it! Have you used Lucidchart, or other charting software? Let us know how it works for you in the comments below.